Is a Caribbean Medical School a Good Choice for a Career in Medicine? In our ten year history, many prospective students have just learned about Caribbean medical education. They aren’t aware of the differences, the similarities to studying at home, or even what it means to be an international medical graduate (IMG) practicing in the United States and Canada. Today, we’re going get into all the ways a Caribbean med school is a viable path, if not even a good choice, for students that want to practice back home. Before we get started, let’s get into why offshore medical schools even exist. In as simple of terms as possible, the demand for doctors simply cannot be met by US schools alone. Residencies (the post-graduation training required to obtain licensure in the U.S.) are often noted as a bottleneck contributing to the physician shortage, but this is not the case. 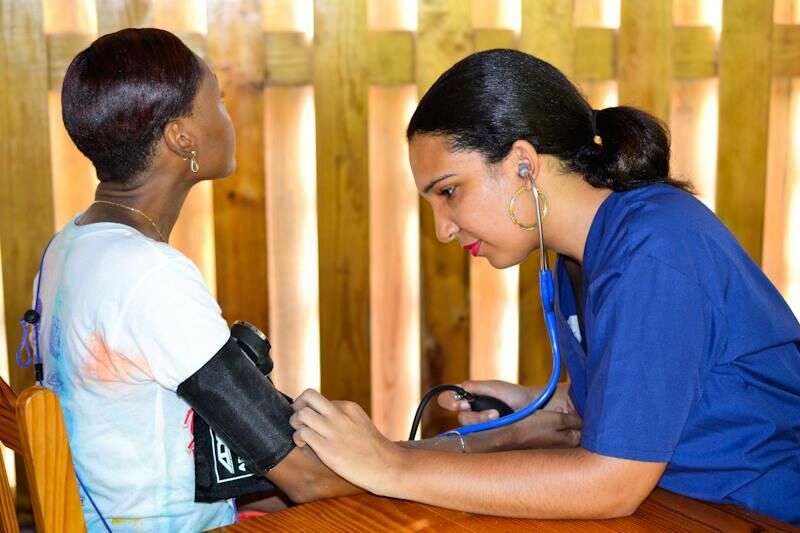 In fact, of the 19,000 new residents that matched last year, nearly 3,000 were US citizens that went to the Caribbean to receive a medical education. 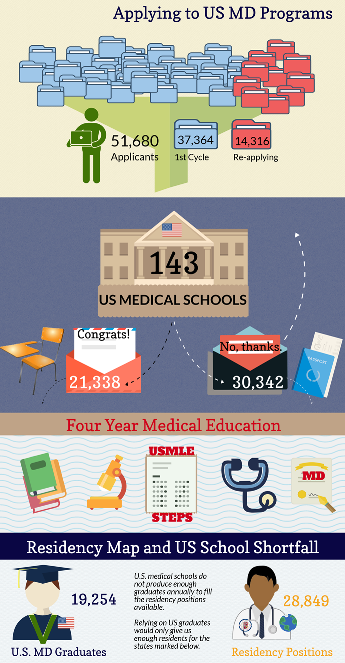 The viable applicant supply is there for US medical schools. So is the demand for them. The problem is the available seats in the schools themselves. The physician shortage was already a looming threat nearly two decades ago, so US medical schools boosted enrollment to the tune of about 28%. In that same time, the applicant pool increased in size by 36%. It wasn’t enough to keep up with supply and still fell short of demand. This isn’t fair to students, and it certainly isn’t fair to communities that need doctors. Attending a medical school in the Caribbean isn’t just about filling a gap in opportunity, though. There are specific advantages that go above and beyond the opportunity itself. We’re going to cover a few right now. 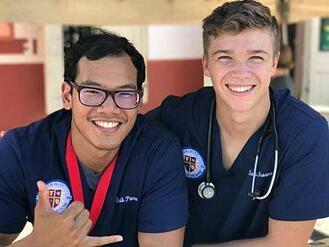 A lot applicants to off shore med schools are looking for a fresh start to meet their full potential. The change in location and distance certainly help (after all, the schools are on literal islands), but so does the campus culture. You are immersed in your studies and surrounded by like-minded people all driving towards the same goal and you’re doing this without your past commitments and obligations that still exist when you stay close to home. You eat, sleep, and breathe medical school for those first two years (except when you don’t, which we’ll get to in the next section). The level of focus this offers is life changing for a lot of students. Applicants with MCAT scores outside of the range sought by US medical schools come to school and recognize that this is an opportunity to prove to themselves that they have the potential to succeed. 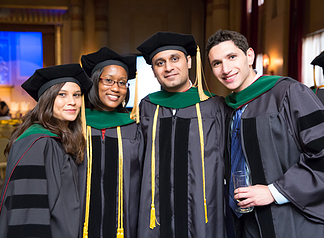 Through faculty support and academic immersion, many of these students perform in the top percentile of the USMLE Step-1 exam, allowing them tremendous access to highly competitive residencies when they graduate. While most of a student’s time will be spent in the classroom, the hospital, or studying, there will still be time to join the local culture in the Caribbean. St. Vincent, in particular, boasts incredible natural beauty, but it is not a resort. It’s a living, working nation that has a unique identity all its own where the students are very welcome. Additionally, campus groups are very involved in local global health outreach. There are major school sponsored programs like the World Pediatric Project. Student groups also have long-standing relationships with local churches, orphanages, clinics, even the Rotary Club. Each year, a large number of the students take part in Vincy Mas as well, the island of St. Vincent’s own version of Carnival. The mere act of expanding your comfort zone to include people with different economic and cultural backgrounds from your own is incredibly important for a physician. It broadens students’ experience pool in a way that lets them better empathize with their patients, elevating the care they can provide. Global health outreach is a significant part of the education students receive from certain Caribbean medical schools—especially Trinity. Some of this is simply by nature of being in another country. Because our annual student enrollment (140 students in 2017) is comparable to the average U.S. medical school, we afford our students an opportunity that few other schools can through our teaching hospital. Our students are in the hospital each week observing, and then interacting, and then assisting physicians during those critical early years of medical school. This practical experience is just not available at other schools. Every alumni we’ve ever spoken to has said the same thing, that they felt more prepared than their counterparts when they entered clinical rotations, and their preceptors commented on just how comfortable they all seemed interacting with patients compared to the US students. Our clinical training is an incredible head start and invaluable when it comes to standing out and getting noticed during rotations, which can lead to better letters of recommendation in pursuit of the almighty residency match. The career-spanning benefits of this particular element can’t be overlooked, though. Global health experience is an increasingly a major factor in residency match and beyond. Moreover, students will simply see patients struggling with issues they would not find back home in the US or Canada. 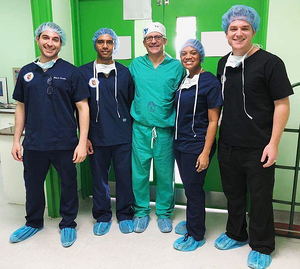 Additionally, the doctors students learn from in the Caribbean are dedicated to treating their patients with more limited resources and often without the technology available in major US hospitals. This sharpens diagnostic ability, adaptability, and, once again, empathy. It has Caribbean students uniquely situated to join groups like Médecins Sans Frontières (Doctors without Borders) as well as rise to leadership positions in major hospitals back home. Speaking of back home. . .
Not all Caribbean medical schools are created equally. When selecting a school, there are some key factors to consider, namely accreditation. As restrictions tighten, the list of schools that are a viable path to medicine in the US and Canada is shrinking, too. The NCFMEA recognition deems these CAAM-HP and ACCM accredited schools as having been evaluated and operating at standards comparable to the US’s Liaison Committee on Medical Education (LCME), the accrediting authority over U.S. medical schools. What does this mean for students? It means the curriculum, the texts, the professors, the schools themselves are evaluated regularly and held to the same standards as their US and Canadian counterparts. It means the schools aren’t just held to their current standard, they must continually improve. It’s why accreditations aren’t permanent. Feedback from the accreditation authority gives the schools new expectations for their next evaluation and guidance to improve. The other major factor is the Education Commission on Foreign Medical Graduates (ECFMG). The ECFMG works with the National Board of Medical Examiners (NBME) and the United States Medical License Exam (USMLE) and students cannot take either the NBME nor the USMLE Step-1, 2, and 3 exams without ECFMG’s authorization. Both are required to practice medicine in the United States. It’s worth noting that while we are listed in the World Directory of Medical Schools with an ECFMG® Sponsor Note,* not all Caribbean medical schools are, and the list will only get shorter. The ECFMG has announced that effective 2023, ECMFG certification is only available to schools that meet accreditation standards deemed comparable to the LCME. This means of all of the schools in the Caribbean, currently only those listed above are meeting that rule. While there are many options out there, and we encourage students to explore all of them, please keep that in mind going forward. Earlier, we spoke on the value of getting outside the US and learning to practice medicine with limited resources, and for complex cases. And while that foundation is incredibly useful, not enough can be said about going home for those last two years of medical school. This is why Caribbean medical schools hold their clinical rotations at teaching hospitals in the United States. Trinity, for example, has its clinical program in Baltimore, Maryland in a system of hospitals that offer the complete core curriculum. Students are welcome, and encouraged, to seek elective rotations across the country in programs of their choosing. Our Canadian students have the opportunity to take on away rotations where they’re from as well. We also provide elective tracks in Chicago, Illinois and Eatonton, Georgia for students who would like assistance customizing their electives to thoroughly prepare them for certain specialties. By bringing students home for clinical clerkships, they’re learning from the doctors that are operating with the resources and patients they’ll eventually see themselves, allowing them to grow that foundational knowledge. They’re also providing residency program directors with the knowledge that they have working knowledge of U.S. hospitals, from the structure and terminology to the expectations of patients. The students learn alongside students from US medical schools. Earlier, we mentioned how preceptors comment on Caribbean students’ comfort level with patients. They’re more than just prepared, they’re thriving when they head back home and, in some cases, even ahead of the curve. The MCAT exam is one of the major gatekeepers of US medical admissions. The over-reliance on the exam is creating a barrier to entry for too many future physicians, as is continually demonstrated by the IMG match rate among US students who got their medical education in the Caribbean. Dr. Darrell Kirch, president of the AAMC, even said it himself, "The MCAT doesn't predict how good a doctor you'll be," he said. "I can point to many very successful medical students when I was a dean who had scores below that, and those [with scores] above that who struggled for various reasons." For context, he was referring to a score of 29, the average of accepted students at time of publication. Under the current scoring protocol, that roughly equates to a score of 506. A low MCAT score shouldn’t be a death sentence for a career in medicine. Too many factors can influence its outcome; anything from school/work/life balance reducing the ability to prepare to a a lack of proper test taking skills and study habits. That doesn’t mean the exam should be tossed away, though, just viewed in the context of the many other criteria that contribute a student’s potential for success. That’s why we require it and consider it a valuable tool to predict past performance and gauge experience, but it is not the criteria for fast elimination as is so often the case in U.S. schools. This is one area that gets complicated for Caribbean medical students. Many of the top Caribbean medical school options out there are significantly more expensive than their counterparts in the United States. Larger Caribbean schools can cost upwards of $250,000 USD in tuition alone. This makes student loans nearly a necessity for most medical students. Now, public perception is that federal loans are the only good option for borrowers. And it’s true that federal loans are not always accessible to students studying abroad. This is a result of an amendment to the higher education act that mandated student populations be at least 60% non-US citizens at schools for them to qualify for Title IV funding. (While we exceed all quality standards, as such a small school, a 60% non-US citizen population would mean only about 45 US students a year could be admitted and our mission is to help mitigate the U.S. and Canadian physician shortage. For this reason we have chosen not to put limits on the enrollment of US students). This perception that federal loans are low cost is based on out of date information and does not account for the origination fees now applicable to graduate federal loans. Federal loan origination fees on the most frequently used Direct Plus program will increase the loan amount by 5% for every loan disbursement. A $20,500.00 Direct Plus loan at 6.31% over forty months would perform (yield interest) similar to a $20,500.00 loan (without loan origination fees) at a 9.45% interest rate. The origination fee alone adds 3.14% to the effective APR. This is dramatically higher than most private loans. So while tuition is a factor, and loans are a part of life for most students, there are excellent options out there to finance a medical education. When it comes to criteria students consider when evaluating an international medical education, residency match is the granddaddy of them all. 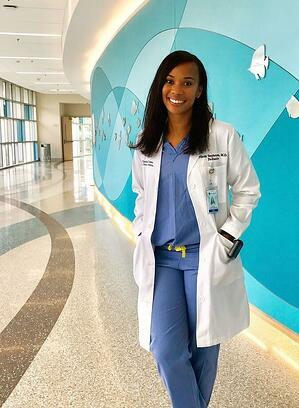 There’s a belief that Caribbean medical students are going to struggle in finding a match, that their status as an IMG relegates them to certain specialties or certain programs. And while it can be a complicated path for some, it is, by no means, a barrier. Each of these areas, through hard work and strategy as well as proper support from an international medical graduate’s school, can make them shine on residency applications. When we said a Caribbean medical school wasn’t a barrier to a match, the data bears that out. The above list covers the top five criteria, but what school you went to? Where the school is? That doesn’t even crack the top 20 criteria for residency match. A good, accredited Caribbean medical school is held to the same standard as US schools and residency directors know this. It ultimately comes down to what the student achieves with the opportunity they’re given and the support they have to succeed after they graduate. A Caribbean medical education isn’t just a second chance. For many students, it can be a good choice that starts their career in medicine with unique experiences, incredible memories, and a mentality of hard work, focus, empathy, and grit simply not found elsewhere in medical education.